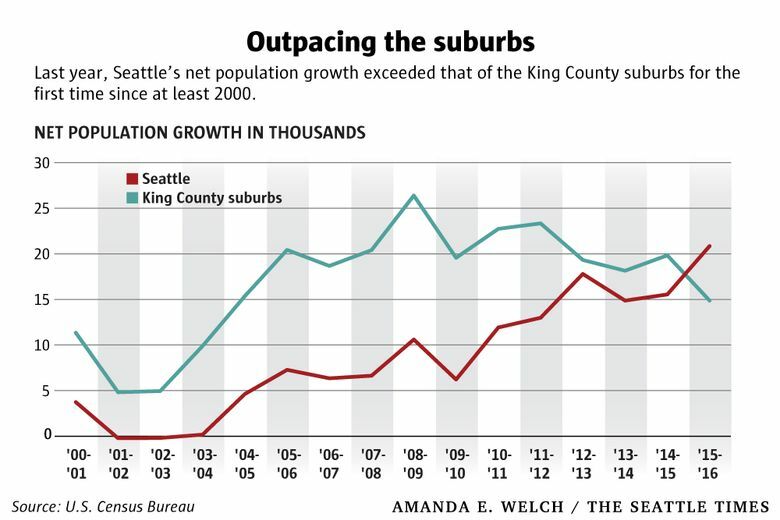 While Seattle’s population growth is soaring, the opposite trend is under way in surrounding King County. Last year, the suburbs experienced their slowest population gains in more than a decade. Well, suburbs, you had a good run. But it looks likes it’s finally come to an end. 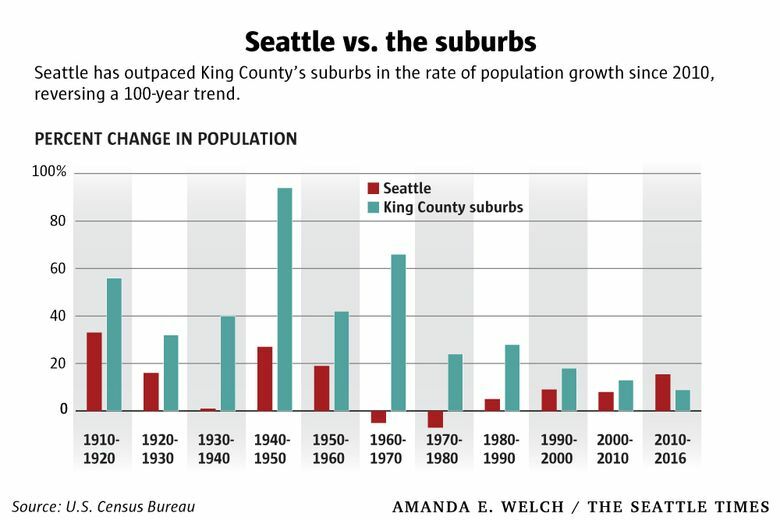 For 100 long years, starting in 1910, the King County suburbs grew at a faster rate than Seattle. Even during the Boeing Bust era of the 1970s, when the city was losing population, the rest of the county maintained double-digit growth. In 2016, Seattle notched its fifth consecutive year of faster growth than surrounding King County, according to my analysis of new U.S. Census Bureau data. In total, Seattle’s population has increased by 15.4 percent since the start of the decade. The rest of the county? Just 8.9 percent. At this point, it clearly isn’t a fluke — it’s a trend. Even more remarkable, perhaps, is that last year, Seattle didn’t just grow at a faster rate than the King County suburbs. The city also added more people in terms of raw numbers: 20,847 to 14,867. It’s the first time that’s happened since the U.S. Census Bureau began producing annual population estimates in 2000. 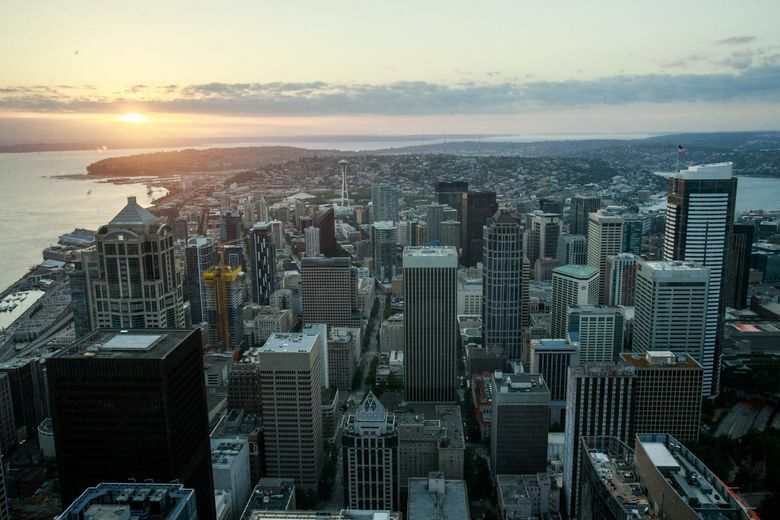 “Seattle lost population from the 1950s until the mid-1980s,” said Chandler Felt, the King County demographer, in an email. He points out that in the 1950s, Seattle’s population only grew because of annexation. But that may have been premature, according to a Washington Post analysis published in May. American suburbs are once again growing at a faster rate than the cities, which have cooled off a bit. Here, we’re trending in the opposite direction. As I reported last month, Seattle had a record-breaking 3.1 percent population growth in 2016, ranking us as the fastest-growing big city in the nation. What I didn’t mention is that things were a lot quieter in the suburbs. Outside of Seattle, King County’s population increased by just 1 percent, the slowest rate of growth since 2004. Felt thinks a variety of factors are at play. There’s been a shift in attitude toward cities, particularly among young people, who are attracted to urban lifestyles and walkable neighborhoods. Also, explosive job growth in central Seattle has stimulated a boom in residential development in the city’s core. Policy has also played a role. “I believe that some of the turnaround since the early 1990s is due to the effects of the Growth Management Act, and its implementation here in King County,” Felt explained. That act, which was adopted by the state Legislature in 1990, is intended to curtail urban sprawl and protect environmentally sensitive lands in fast-growing areas by regulating development. According to Felt, since the Growth Management Act went into effect, there has been a dramatic shift in residential building permits away from outlying and rural areas toward the biggest cities. Pierce and Snohomish counties, which have been absorbing more of the region’s growth recently, both grew by about 2 percent last year. That’s significantly faster than the King County suburbs, but still not as fast as Seattle.